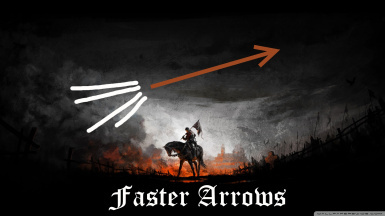 This mods makes arrows more fun to use than vanilla, by making them fly a lot further and faster, which is way more realistic than those slow arrows. Unfortunately, by making the arrows faster, it will also do more damage, so there are alternate versions of the mod, the higher the "thrust" variable, the faster and the more damage. The "only gravity" version only changes the gravity of the arrow, so It will still fly further, but with vanilla speed and damage. To uninstall simply remove the .pak file again. For more realism I recommend the remove those stupid trails mod by Zaatch.